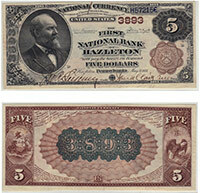 There are about 500 bank notes like this known to exist. That total is for every bank in the country though. Each note is valued based on its own individual merits. The most important factors are the bank of issue and the condition. Some banks are relatively common and others are quite scarce. High grade notes from this series are also rarely encountered. We consider XF or better to be high grade. Please contact us for details. Don't forget to check the serial number. Number 1 notes always sell for nice premiums.